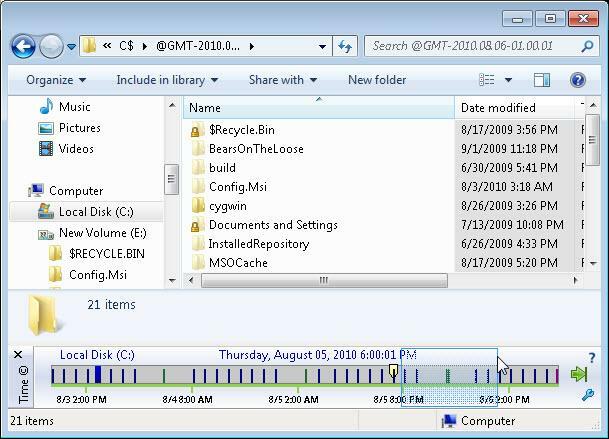 Timeline The timeline is populated with points-in-time when the Windows Explorer address refers to a local fixed disk and that disk contains volume shadow copies. When the address is not a local fixed disk TimeTraveler is not loaded. When the Windows Explorer address is the root of a file system it is populated with all its points-in-time, each being a shadow copy. TimeTraveler displays two types of shadow copies: restore-points (dark green) and non-restore-points (dark blue). Restore points are shadow copies that can be used to restore the system. TimeTraveler uses both both types but creates only non-restore-point shadow copies. There is a good reason for this: non-restore-points require less system resources to create. Figure 1 is an image of a TimeTraveler showing the root of a file system. 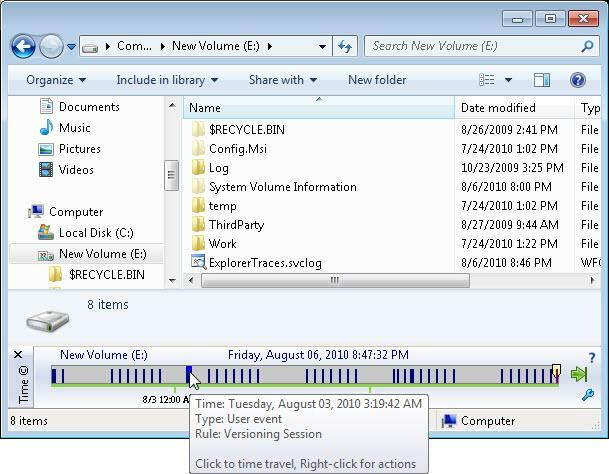 Notice that the Explorer selection name displayed in the upper left of the timeline is for the volume and contains the drive letter. 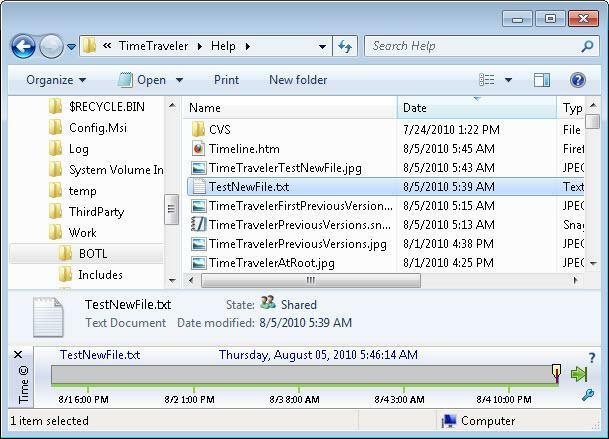 From here, if you select a file or a folder, TimeTraveler will indicate when the selection was modified by changing the color of the points-in-time. Dark green and blue means that there is a new version of the file at the point-in-time and pale green or blue means that the selection has not changed. Remember that to understand change, you must read the points-in-time from current time to the earliest time or from right to left. The first dark point-in-time to the left of the current time is the most recently changed version before the current version. 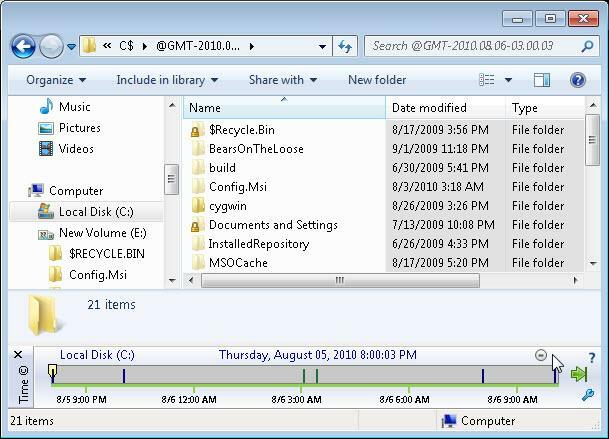 Figure 2 shows all the versions for the file Timeline.htm. 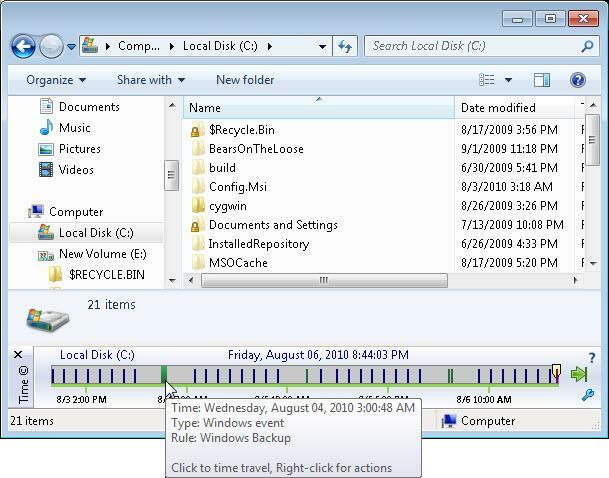 Note that the Windows Explorer Details Pane indicates that the file's "date modified" is 8/1/2010 5:04 PM. On Figure 3 we have moved the time cursor to the last previous version and the "date modified" time is 8/1/2010 4:27 PM. Notice also that the background behind Explorer's right side panel is gray to indicate that a past time is being navigated. The pale-blue points-in-time to the left of this point-in-time contain the same version of the file therefore their modified times are also 8/1/2010 5:04 PM. Timeline Because the computation identifying the versions of the points-in-time can be lengthy TimeTraveler performs it in the background. When it is completed TimeTraveler displays the new colored points-in-time. 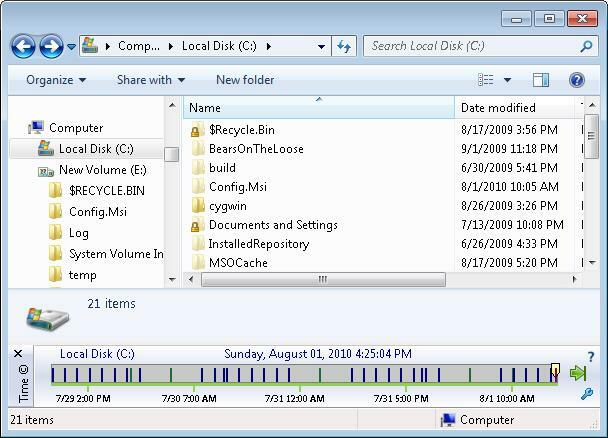 This means that you can still interact with Windows Explorer while this is going on. If you happen to change the selection during a computation then TimeTraveler will cancel it and start again with the new selection. The now button is changed to a spinning wheel for the duration of the computation. You can still click it to bring Windows Explorer to now. To navigate to a point-in-time you can either use the mouse or the keyboard. Using the mouse, you left-click the time marker. Using the keyboard, click the left and right arrows to navigate between points-in-time that are versions (the dark ones). Use Control with the arrow keys to navigate between all points-in-time. If the selection did not exist at a certain point-in-time, TimeTraveler does not show these points-in-time for this selection. Look at Figure 4 where we just created a new test file and selected it. Timeline If you roll the mouse pointer over a point-in-time and keep the pointer on the point for an instant, a tooltip will be displayed indicating the point's date and time, the type of event that created it and some event information. There are three types of events that can trigger the creation of points-in-time. The first type is the "Windows" event type. They are triggered by a modification to the system like the installation of a program, a system checkpoint was scheduled or a backup was taken. Windows events always generate restore points. The second type is the "schedule" type. 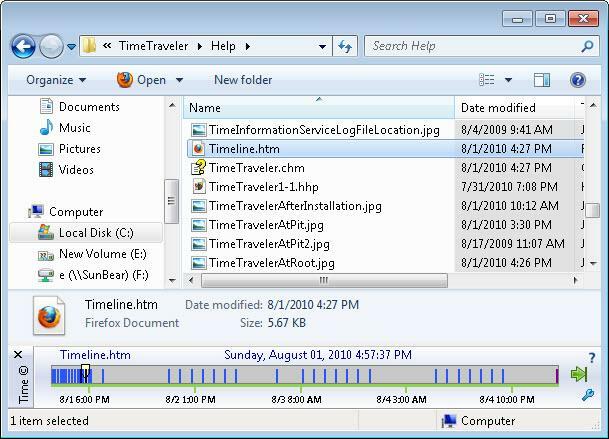 A scheduled point-in-time is created by TimeTraveler. This only happens when you configure TimeTraveler to create points-in-time at regular intervals. The third event type is user event type. For this type, TimeTraveler creates a point-in-time when requested by the user or by the change tracking engine, also called the versionning engine. 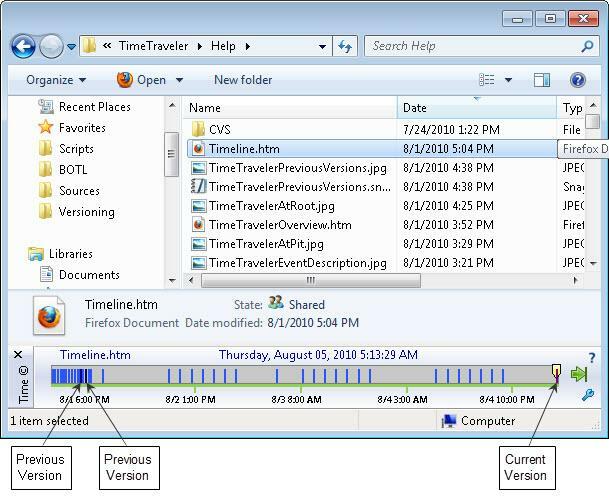 Change tracking essentially allows the user to configure TimeTraveler to create points-in-time based on file activity. It is explained in details in the section Track Changes. Timeline If you find the points-in-time are too close together to distginguish, you can zoom in on any subsection of the timeline by selecting that area. To do this, left click where you want to start, hold the mouse button and drag the mouse where you want to stop. This will cause a blue and transparent rectangle to appear and when you release the mouse button that area of time will fill the timeline. See figure 7. Figure 8 shows the zoomed in timeline. You further zoom in by repeating the process as many times as you want. To zoom out, press the round button with a minus sign in the top-right corner of the timeline. 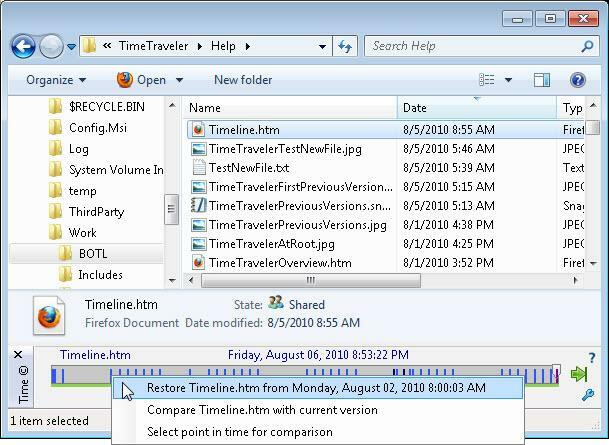 TimeTraveler provides other functionalities via its time marker context menu. Right-click on any time marker and a menu will appear. 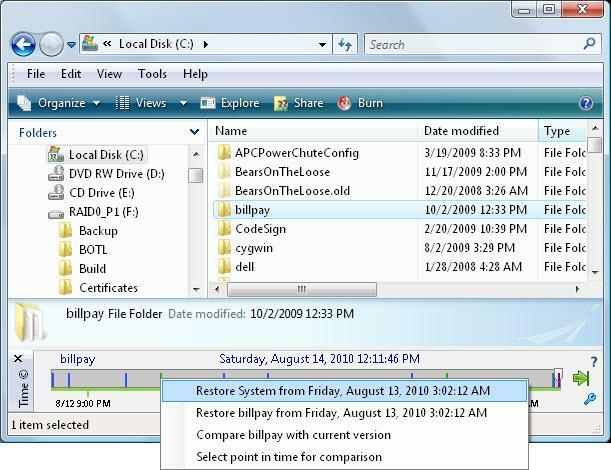 For non-restore points you can restore the Explorer selection, compare the version at the point-in-time with the current version or select the point-in-time for comparison with another point-in-time. See figure 10. Timeline For restore points, you can also restore your Windows machine to the selected point-in-time. See figure 11. These functionalities are explained in more detail in coming sections of this help file.